A friend of ours was throwing a large 3 day birthday-bash. They had a large sheet cake lined up for all the gluten-eating guests, but nothing for herself (the birthday girl). 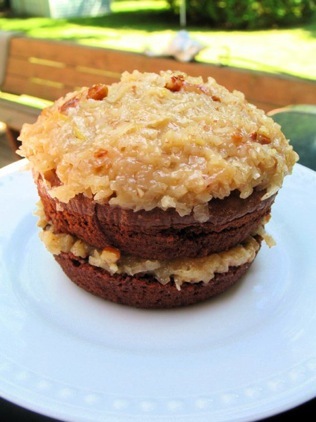 Our friend asked Peg if she could make a gluten-free German Chocolate Cake. Instead of standard sized cake, Peg decided to make a doz. cupcakes and this mini-cake. The cake was a hit! Our friend was so excited she dug into it immediately and shared it with a few other gluten-free guests. Another gluten-free guest headed directly for the cupcake container after seeing the mini-cake. Peg is becoming quite the Google Master. She found the recipe in a cake baking forum - without any help from me. After reading through the forums posts, it appears this recipe is from The Cake Mix Doctor Bakes Gluten-Free book by Anne Bryn. The premise of the book is to take ordinary [gluten-free] cake mixes, "doctor them up" and make them better! This is one cookbook we don't have. This mini-cake was made in 4 1/2" tart pans. We sliced the top off of the bottom layer to make it flat. The rest of the batter went to make cupcakes.